Not to be confused with Comcast Technology Center. For other uses, see Comcast Center (disambiguation). Liberty/Commerz 1701 JFK Boulevard L.P.
Comcast Center, also known as the Comcast Tower, is a skyscraper in Center City, Philadelphia, Pennsylvania, United States. The 58-story, 297-meter (974 ft) tower is the second-tallest building in Philadelphia and the state of Pennsylvania, as well as the twenty-third tallest building in the United States. Originally called One Pennsylvania Plaza when the building was first announced in 2001, the Comcast Center went through two redesigns before construction began in 2005. Comcast Center was designed by Robert A.M. Stern Architects for Liberty Property Trust. At the beginning of 2005, the final redesign and its new name—the Comcast Center—was unveiled. The building is named after its lead tenant, cable company Comcast, which makes the skyscraper its corporate headquarters. Leasing 1,094,212 square feet (101,656 m2), Comcast takes up 89 percent of the building. The building features retail and restaurant space and a connection to the nearby Suburban Station. In Comcast Center's lobby is the Comcast Experience, which is a 2,000-square-foot (190 m2) high-definition LED screen that has become a tourist attraction. Designed to be environmentally friendly, the skyscraper is the tallest Leadership in Energy and Environmental Design (LEED) certified building in Philadelphia. In 1999, class-A office vacancy in the city was at 6.6%, leading developer Willard Rouse to envision a new tower. Eventually the developer settled on the location where he constructed this building, a 2-acre (8,100 m2), $288 per square-foot parcel owned by Equitable Life Assurance Co. In 2000, architect Robert A. M. Stern began working on a design for a skyscraper being planned by Liberty Property Trust in Philadelphia, Pennsylvania. In 2001, Liberty Property Trust announced its plan to build the 52-story One Pennsylvania Plaza in Center City. Anticipated US$400 million, One Pennsylvania Plaza was to be 750 ft (230 m) and made of kasota stone similar to the Philadelphia Museum of Art. The site for the future skyscraper was at 17th Street and John F. Kennedy Boulevard, a site occupied by a building that housed the Defender Association of Philadelphia and a parking lot. Demolition of the building began in 2002 and ended in 2003. Cable company Comcast had been looking for possible new headquarters space in anticipation of the end of its lease in Centre Square in 2006. Comcast was looking for more than 400,000 square feet (37,000 m2) of office space and developers were actively courting the company for their developments. Comcast was the only employer in the city with major expansion plans at the time. Comcast was considering staying in Centre Square, while also contemplating moving their headquarters to the new Cira Centre building or One Pennsylvania Plaza. Comcast was spread out over 10 floors in two buildings at Centre Square and wanted space on contiguous floors. In January 2004, Liberty Property Trust unveiled a redesign for the building. The redesign turned One Pennsylvania Plaza into a 60-story, 962 feet (293 m) tower, making it the tallest building in the city at the time. In the redesign, the kasota stone was changed to a lighter granite and a short pyramidal roof was added. The redesign was a result of discussions that had begun in 2003 with Comcast about moving into the tower. On January 3, 2004, Liberty Property Trust signed a 15½-year lease with Comcast and a construction contract with L.F. Driscoll Co. Liberty Property Trust also unveiled another redesign of the building and its new name, the Comcast Center. The now 975-foot (297 m), 58-story Comcast Center would no longer have a pyramid top and would have a complete glass facade. The architectural model was created by Richard Tenguerian. Liberty Property Trust hoped to get the One Pennsylvania Plaza site designated a Keystone Opportunity Improvement Zone (KOZ). KOZ designation was intended to encourage development in poor, blighted areas by exempting the tenants of the building from all state and local taxes. Designating One Pennsylvania Plaza a KOZ was supported by then Pennsylvania Governor Ed Rendell, who said it was important to keep corporations within the city. At the time, many of Philadelphia's big employers' leases, including Comcast's, were due to expire, and the employers were considering the possibility of moving out of the city and state. Rendell also said allowing Comcast to enlarge its headquarters by moving into One Pennsylvania Plaza could attract other corporate headquarters to the city. However, other Center City building owners, including Comcast's landlord at Centre Square, HRPT Properties Trust, were opposed to the plan. They said giving the tower the KOZ designation would give it an unfair advantage because Liberty Property Trust could charge above-market rents since the tax breaks would offset the cost for tenants. The group believed tenants attracted to One Pennsylvania Plaza because of the tax breaks would cause more vacancies in other Center City skyscrapers, rather than attracting more business to blighted areas as intended under the law. In early 2004, Center City had a vacancy rate of 12.8%. Both sides of the issue hired law firms, lobbyists, and business associates to promote their positions to city and state officials. A report by the Center City District said if both One Pennsylvania Plaza and the Cira Centre, another skyscraper in the KOZ controversy, were filled by corporations moving from other Center City office towers, the city could lose US$153 million by 2018. A report released by the group of building owners opposed to KOZ says the two buildings could cost the city almost US$91 million a year. In contrast, a report issued by a consulting company hired by Liberty Property Trust said that a KOZ designation for the skyscraper could generate US$27 million for the city. Critics of the KOZ designation also claimed that close relationships between Liberty Property Trust and Comcast and the Rendell administration were inappropriately influencing the governor's position on the issue. When Rendell was mayor of Philadelphia, David L. Cohen, a Comcast executive vice president, was Rendell's chief of staff, and William P. Hankowsky, Liberty Property Trust's chief executive, was director of Philadelphia's development agency. Rendell dismissed the claims, saying "Every building owner in town was a contributor to me." 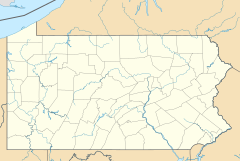 Chances the bill would be passed ended in November 2004 when House Republicans in the Pennsylvania General Assembly decided not to bring the bill to a vote. Later that year, Governor Rendell released US$30 million from the Redevelopment Assistance Budget to Liberty Property Trust. Through the state's Department of Economic and Community Development, Comcast received US$12.75 million that included a US$4-million opportunity grant, US$6.75 million in job-creation tax credits, and US$2 million in job training assistance. Despite the failure to gain KOZ status, the project received US$42.75 million in financial incentives from the state. The official groundbreaking ceremony was on March 31, 2005. The ceremony, which was held at night, featured a light show coordinated with a piece of music entitled "Elevation". The song was composed specifically for the event by Curtis Institute of Music graduate Steven Hackman and recorded by the Curtis Institute of Music Orchestra. The groundbreaking also featured Kodo, the Germantown High School drumline, and a 6-foot-tall (1.8 m) ice sculpture of the Comcast Center. As the building was under construction, in March 2006, Liberty Property Trust ran into trouble with Philadelphia's Plumbers Union Local 690, which had issues with the building's waterless urinals. The waterless urinals were part of the plan to make the Comcast Center an environmentally friendly building because they would save an extra 1.6 million US gallons (6,100 m3) of water a year. The plumbers union opposed the waterless urinals, claiming they were unsanitary and would provide less work for the plumbers. Philadelphia's Plumbing Advisory Board approved the waterless urinals on April 5 after a compromise, which stated that the building's owners and city officials would monitor the performance of the waterless urinals, was reached. Piping that would allow water to flow to the urinals in case they needed to be converted was installed in the Comcast Center, which Liberty Property Trust says was always part of the building's plan. A week later, on April 13, Liberty Property Trust sold an 80-percent interest in the Comcast Center to German real estate firm CommerzLeasing & Immobilien AG, a subsidiary of Commerzbank AG. The deal completed Liberty Property Trust's planned recapitalization of the anticipated cost of the building, and the value of the joint venture, called Liberty/Commerz 1701 JFK Boulevard L.P., included mortgage debt and equity. On June 18, 2007, the Comcast Center was topped out. The ceremony, which was held in the building's future plaza, featured the raising of a steel beam to the skyscraper's highest point. The beam was signed by workers and guests and as it was raised, on account of tradition, an American flag and a tree sat on the beam. Also sitting on the beam was a statue of Philadelphia-founder William Penn. The statue was there to counteract the 1980s "curse" of Billy Penn, which prevented Philadelphia's sports teams from winning a championship following the construction of buildings taller than the statue of William Penn on top of the 548-foot (167 m) Philadelphia City Hall. The 25-inch (64 cm) statue of William Penn remained on the beam until it was stolen. The statue was replaced and the "curse" ended when the Philadelphia Phillies won the 2008 World Series. Even though the building had not officially opened, Comcast office workers began moving in early December 2007, ahead of the scheduled completion in March 2008. The Comcast Center officially opened on June 6, 2008. A study sponsored by Comcast and Liberty Property Trust said the construction of the Comcast Center created 17,200 jobs and generated US$2 billion of economic activity for Pennsylvania. Despite opposition by other building owners to construction of the Comcast Center, by the time most space in the Comcast Center had been leased vacancy rates in Center City offices were falling and rents were rising. Even HRPT Properties Trust had leased 70 percent of the space Comcast vacated by 2007. The predictions by opponents did not occur mainly because Comcast ended up leasing 89 percent of the building and the offices for the Comcast Center's second-largest tenant, Citizens Bank of Pennsylvania, were new to the city. The Comcast Center is the second-tallest building built in America outside of New York City or Chicago since 1993. The 1,250,000-square-foot (116,000 m2) Comcast Center has 58 floors, of which 56 are occupiable. The structure of the Comcast Center comprises a central concrete core with steel-framed floors. The building's exterior features a glass curtain wall made of lightly tinted, non-reflective low-emissivity glass. The tower tapers inward towards the top and features two cutouts near the top of the building on the north and south sides. To prevent the tower from swaying too much in the wind, the Comcast Center contains a 300,000-US-gallon (1,100 m3) double-chambered concrete tuned liquid column damper, the largest such damper in North America. Receiving a gold Leadership in Energy and Environmental Design (LEED) rating in April 2009, the Comcast Center is the tallest LEED building in Philadelphia. The building was designed to use 40 percent less water than a typical office building, and the plaza was designed to reduce heat-island effect from the pavement by 70 percent. Reducing air conditioning and lighting costs, the low-emissivity glass curtain wall blocks 60 percent of heat while allowing 70 percent of the Sun's light inside. The Comcast Center can be viewed from some Philadelphia suburbs, such as this view from Cheltenham. The skyscraper has 1,238,000 square feet (115,000 m2) of rentable space, including 36,000 square feet (3,300 m2) of restaurant and retail space called The Market at the Comcast Center. 16,500 square feet (1,500 m2) of retail space is on the underground concourse while the rest is located on the street level. The building features high ceilings with some floors having a ceiling height of 13 feet (4 m). The lower floors on the south side of the building feature four three-story stacked atrias. The building also features a 500-seat concourse level dining court and an 87-space private underground parking garage. ThyssenKrupp provided the building's 30 gearless elevators, seven hydraulic elevators, and two escalators. The Comcast Center faces a half-acre public plaza. The plaza, designed by Lucinda Sanders of OLIN, sits over underground railroad tracks. It features a seasonal outdoor restaurant, Plaza Cafe at Table 31, that is sheltered by a trellis. Between the cafe and the building entrance is a choreographed fountain designed by Wet. The tower's entrance is a 110 feet (34 m) tall winter garden. The winter garden entrance directly connects to the underground concourse of Suburban Station. The building also has a lobby entrance that leads to the Arch Street Presbyterian Church adjacent to the tower. The exterior lighting scheme of the building was designed by Quentin Thomas Associates, and consists primarily of white LEDs color-temperature matched to the fluorescent lights used by the interior. Along each floor, the corner spandrel panels feature upward and downward-facing 4,100K LEDs to create the appearance that the length of the building has been bottom-lit by spotlights. The only major consistently active color element can be found at the top of the tuned mass damper; a single row of color-changing LEDs that is programmed to commemorate special events. For example, the top would be colored pink for Breast Cancer Awareness Month. Philadelphia Inquirer architecture critic Inga Saffron described the Comcast Center as "a respectable work of architecture" that was "dignified in its stance on the grid, generous in its relationship to the city, responsible in its treatment of the environment." She felt the tower's shape reminded her of a giant flash drive. Saffron said the building excelled at the street level, praising the plaza, concourse, and its connection to Suburban Station. In 2009 the Comcast Center was awarded the Urban Land Institute Award for Excellence in the Americas category for the transformation of what was once mostly a vacant lot into a transit gateway. The Comcast Center's winter garden entrance contains two works of installation art. The Comcast Experience is a 25.4 feet (7.7 m) tall, 83.3 feet (25.4 m) wide, 2,000 square feet (190 m2) high-definition LED screen situated on a wall in the winter garden. The screen is composed of 7.8 million, 4.66mm pitch pixels housed in 6,771 LED modules of the type used in the Barco NX-4 panel. The installation, designed and produced by Niles Creative Group, premiered on June 6, 2008, and runs eighteen hours each day. The content of the video includes panoramic views of Philadelphia historic sites, images of space, dancers, acrobats and actors moving around a background designed to mimic wood paneling of the walls of the lobby. Another part of the installation displays images of cranes and machinery forming the design of a clock that tells the correct time of day. The Comcast Experience quickly became a popular tourist attraction, prompting city officials to add the Comcast Center to its tourism website. Between Thanksgiving and New Year's Day 2008, a holiday video was included as part of the installation. The second piece of art is Jonathan Borofsky's Humanity in Motion. Located in the glass atrium of the winter garden, Humanity in Motion shows ten life-size human figures walking across ten horizontal poles positioned at different levels of the atrium. At ground level, looking up at the stainless steel figures, are two more figures shaped to look like a father and son. Comcast is the skyscraper's largest tenant, leasing 1,094,212 square feet (101,656 m2), or 89 percent of the building. The second-largest tenant is Citizens Bank of Pennsylvania, which leases 56,000 square feet (5,200 m2) of office and retail space. Other tenants include the Judge Group, a staffing agency, which leases 6,427 square feet (600 m2). Comcast's office space was designed by Daroff Design + DDI Architects and Gensler. Comcast's space is topped by a conference room floor with the executive offices on the four floors below it. Below that are more offices and then, on the 43rd and 44th floors, is Ralph's Cafe, a two-story cafeteria space named after the company founder Ralph J. Roberts. Below the cafe is the training center called "Comcast University". The rest of the space is used for content and programing teams, customer service, Technology & Product teams, Finance and Legal. The interior design of the offices are designed with a variety of shape and color ranging from the open white space of the upper offices to the colorful walls of the training center. Other designs include a glass and stainless steel staircase that wraps around a four-story column of flat-screen monitors and connects the executive floors. The retail portion of the tower includes numerous shops and eateries. The shops and eateries include national and regional chains, and initially featured a restaurant called Table 31. Table 31, which had a cafe on the plaza and a restaurant spread over three floors in the tower, was owned by Philadelphia restaurateurs and chefs Georges Perrier and Chris Scarduzio. The restaurant was named after a popular table at the former Perrier and Scarduzio establishment Brasserie Perrier. Table 31 closed in 2013, amid a dispute among its owners, and was replaced by another upscale steakhouse, named "Chops". ^ Bruce Buckley (November – December 2007). "Comcast Center Tower Towering Over Philly". Constructor. Archived from the original on August 28, 2008. Retrieved February 18, 2011. ^ "Comcast Center - The Skyscraper Center". Council on Tall Buildings and Urban Habitat. Archived from the original on June 29, 2013. ^ a b Holcomb, Henry J. (January 4, 2005). "Work to begin in 2 weeks on Comcast skyscraper in Philadelphia". The Philadelphia Inquirer. ^ a b c "Comcast Center gets LEED certification". Philadelphia Business Journal. April 23, 2009. Retrieved August 25, 2009. ^ Taylor, Candace (May 29, 2009). "The Closing: Robert A.M. Stern". The Real Deal. Retrieved February 1, 2016. ^ Peter Morris Dixon (ed.). Robert A. M. Stern, 1999-2003. New York, NY: Monacelli Press. ^ a b c d e Maule, R. Bradley. "Comcast Center Timeline". Comcast Center. phillyskyline.com. Retrieved March 30, 2009. ^ a b Holcomb, Henry J. (July 31, 2002). "Comcast Delays Decision on New Space for Philadelphia Headquarters". The Philadelphia Inquirer. ^ Holcomb, Henry J. (October 25, 2001). "Philadelphia's Public Defenders Get New Home; Site Free for Development". The Philadelphia Inquirer. ^ Holcomb, Henry J. (May 1, 2003). "Developers Compete to Build New Comcast Corp. Headquarters in Philadelphia". The Philadelphia Inquirer. ^ Holcomb, Henry J. (January 22, 2004). "Liberty Property Trust Proposes Plan for Skyscraper in Philadelphia". The Philadelphia Inquirer. ^ a b c d Pristin, Terry (February 18, 2004). "Downtown Philadelphia Roiled by Proposed Subsidy". The New York Times. Archived from the original on January 31, 2013. Retrieved March 28, 2009. ^ Kostelni, Natalie (December 19, 2003). "Battle brewing over KOZ". Philadelphia Business Journal. Retrieved March 28, 2009. ^ Holcomb, Henry J. (February 22, 2004). "Philadelphia Skyscraper Wars Could Have Lasting Impact on City". The Philadelphia Inquirer. ^ Kostelni, Natalie (May 7, 2004). "Group releases another anti-KOZ report". Philadelphia Business Journal. Retrieved March 28, 2009. ^ Kostelni, Natalie (January 3, 2005). "Controversial skyscraper will be built in downtown Philadelphia". Philadelphia Business Journal. Retrieved March 28, 2009. ^ Steve Hackman conducts his original piece "Elevation", YouTube.com, stevehackman08. ^ Garvin, Keith (March 29, 2006). "'No Flush' Urinal Controversy Could Sink Philly Skyscraper". ABC News. Retrieved March 29, 2009. ^ "Waterless urinals a go for Comcast Center". Philadelphia Business Journal. April 5, 2006. Retrieved March 29, 2009. ^ Holcomb, Henry J. (April 14, 2006). "Liberty sells 80% of Comcast Center: The deal, with a German firm, values the new skyscraper at $523 million". The Philadelphia Inquirer. ^ Holcomb, Henry J. (June 18, 2007). "Comcast Center topped off". The Philadelphia Inquirer. Archived from the original on March 11, 2009. Retrieved March 29, 2009. ^ "Liberty Property Trust Celebrates Topping Off of Comcast Center". Business Wire. June 18, 2007. ^ "About the Curse". The Curse William Penn. Phrustrated Phan Films. Retrieved May 21, 2009. ^ Horan, Kevin (October 10, 2008). "William Penn atop Philly once again". MLB.com. Retrieved March 29, 2009. ^ "Quiet opening for city's new giant, Comcast Center wows workers as they slip in". The Philadelphia Inquirer: A01. December 22, 2007. ^ a b c d Leonard, Jeanne (June 6, 2008). "Comcast Center Claims Its Place Atop the Philadelphia Skyline" (Press release). Liberty Property Trust. Retrieved May 19, 2009. ^ "Comcast Center construction generated $2B in activity, study says". Philadelphia Business Journal. June 6, 2008. Retrieved March 29, 2009. ^ Fernandez, Bob (June 19, 2007). "Office space in city rebounds". The Philadelphia Inquirer. ^ a b c "Comcast Center Fact Sheet" (PDF). MLB.com. January 2004. Retrieved March 29, 2009. ^ a b "1701 John F Kennedy Blvd • Comcast Center". Liberty Property Trust. Retrieved March 29, 2009. ^ Avril, Tom (April 15, 2007). "Water to tame wind atop new skyscraper". The Philadelphia Inquirer. ^ a b "Richard Branson training for space flight in Bucks". Philadelphia Business Journal. December 7, 2007. Retrieved May 21, 2009. ^ "Elevators will scale the Comcast Center". Building Design & Construction. January 1, 2006. ^ a b Maule, R. Bradley. "14 August 07: Rollin' with Olin on the plaza". Comcast Center. phillyskyline.com. Retrieved March 30, 2009. ^ Maule, R. Bradley. "16 April 08: Lights... camera..." Comcast Center. phillyskyline.com. Retrieved April 12, 2009. ^ Riggs, Trisha (April 24, 2009). "Winners and Finalists". Urban Land Institute. Retrieved May 21, 2009. ^ "Embracing Art, Architecture and Technology, The Comcast Experience Debuts at Philadelphia's Comcast Center, Highlighted by a 10-Million Pixel Barco NX-4 LED Installation". Digital Signage Universe. Archived from the original on January 16, 2010. Retrieved March 30, 2009. ^ Morris, Christine (June 10, 2008). "Barco, Comcast and Liberty Property Trust unveil "The Comcast Experience" at Philadelphia's Comcast Center". Barco (Press release). Archived from the original on July 16, 2011. Retrieved July 18, 2010. 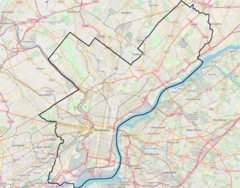 ^ "Comcast & Liberty Property Trust Unveil A New Philadelphia". Comcast Corp. Retrieved March 30, 2009. ^ "Humanity in Motion". Jonathan Borofsky. Retrieved April 2, 2009. ^ Kostelni, Natalie (October 25, 2005). "Comcast Center not just for Comcast anymore". Philadelphia Business Journal. Retrieved March 30, 2009. ^ "Judge Group opening office at Comcast Center". Philadelphia Business Journal. January 3, 2008. Retrieved May 19, 2009. ^ Sullivan, C.C. (October 1, 2008). "Daroff and Gensler channel the lightness and clean lines of a Philadelphia tower into striking headquarters for Comcast". Interior Design. Archived from the original on April 2, 2009. Retrieved May 22, 2009. ^ Kostelni, Natalie (November 2, 2007). "Comcast Center nearly full". Philadelphia Business Journal. Retrieved March 30, 2009. ^ Kostelni, Natalie (April 22, 2008). "Le Bec-Fin owners' Comcast Center site to open May 18". Philadelphia Business Journal. Retrieved March 30, 2009. ^ "Table 31 to close". Philly.com. September 6, 2013. Retrieved April 14, 2016. ^ "Chops replacing Table 31". Philly.com. November 18, 2013. Retrieved April 14, 2016. 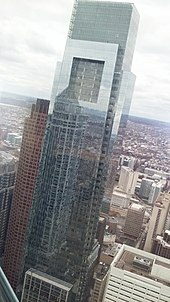 Wikimedia Commons has media related to Comcast Center (office building).